Nothing to do with Wandsworth, but the picture is the badge of Grimsby Borough Police, which I spotted on a display at the National Policing Improvement Agency this week. Nothing directly to do with Wandsworth, of course, I spotted because I stood for Great Grimsby in 2001. But it is a little reminder that neighbourhood policing is nothing new. 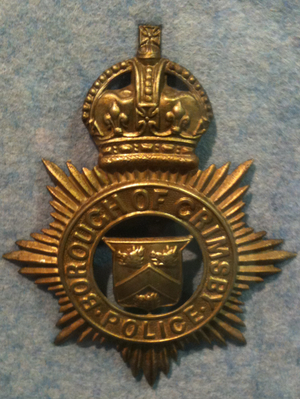 Up until the mid- to late-sixties there were small borough police forces dotted all over the country (Grimsby’s was amalgamated with Lincolnshire in 1967). Grimsby would have served a population of around 80,000, less than a third the size of Wandsworth (around seven times the size of a Wandsworth ward on which Safer Neighbourhood Teams are based). Grimsby, like all the other Borough Police Forces, was abolished following the Police Act 1964 in a bid to improve economy and efficiency by having larger policing units. I won’t comment on whether this was a good or bad thing; but just leave it as a reminder that the current vogue for community based policing is little more than a return to the historical roots for the police as a very local service in many parts of the country. It has not been a good week for Wandsworth when it comes to crime, with some high profile incidents. I refrained from commenting on them at the time since I didn’t think this the most appropriate place – this is not a ‘news’ blog and I can’t consistently provide details. I’m also very aware that not everything is for public consumption and I’d rather err on the side of caution than risk compromising ongoing police investigations. Having said that, I am also aware that an information vacuum causes its own problems. There are, however a few points I’d like to make. First on the Tooting murder and attack I would like to extend my sympathies the family of Ekram Haque. To have lost a father and grandfather in such a meaningless way is a tragedy I cannot begin to understand. If anyone has information regarding either of the incidents I would urge them to contact the police. I would also like to congratulate the police on the speed with which they have responded, not only in making arrests to bring the perpetrators to justice, but also to provide reassurance to the community. The other ‘bad’ news was the two unrelated shooting incidents in Battersea. Again, congratulations to the police in moving so quickly to make arrests. I know events like this do nothing to make communities feel safer, even more so when they happen so close together. But I would reiterate that Wandsworth is a relatively safe borough. We are part of an inner city, and that naturally brings problems – we’re never going to complete with a sleepy village on low crime rates – but compared with the rest of London and other cities across the country we are a safe place to live, work and play. What’s more, despite the Tooting attacks which appear to be racially motivated (both involved black youths attacking Asian victims) we are a harmonious community – despite the diversity we all get along well. This isn’t to say we can be – or are being – complacent but incidents like these are thankfully rare in Wandsworth and everyone in the community safety partnership are working hard everyday to keep it that way.